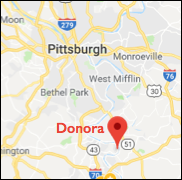 With the EPA undergoing extensive downsizing and the Trump administration wanting to open previously protected lands to oil and shale drilling, Donora continues to remind the nation of the need for clean air. "People would come to the town, and they would say, 'What’s that smell?' And people who lived here would say, 'What smell?' And my grandpa would say, 'Well, it smells like money.'"